If the brain receives messages through the senses it will interpret the messages and react to the information. It is through the process of sensory messages that the child will be able to develop concepts, thinking processes and reasoning. Children will be able to develop abstract thinking through this process. Although humans have five senses, only two of them are over-accentuated in our daily information processing load. These are the eyes and the ears. The eyes and the ears are responsible for two very important informational inputs: visual and auditory. However, the external output systems (mouth, voice, hands and feet) are of particular relevance to understanding a person’s reaction to information. While Mommy pampered in the day spa one of the We'll keep the children busy with neurological and sensory integration activities. 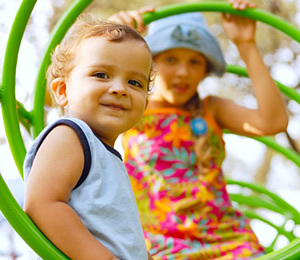 The children learn through play and attention is given to physical, perceptual and creative development.